I love British comedy. Well, not all of it, but a great deal of it. ‘The Young Ones,’ ‘Black Adder 1, 2, 3, and 4’ (2 was the best), ‘Fry and Laurie’ (yes, ‘House’s’ Hugh Laurie), ‘Mr. Bean,’ ‘The Goon Show,’ ‘Red Dwarf” … The list goes on. And, at the top of the list, something completely different – ‘Monty Python’s Flying Circus’ (other suggested titles were ‘It’s,’ ‘Owl Stretching Time,’ and ‘The Toad Elevating Moment’). You have two paths that you can travel through this app – “Day by Day” or “Scene by Scene.” Navigation is extremely simple. Icons of film slates, diaries, and so forth cram every single page with dozens of items to browse for every single day of shooting. Even though a stand alone app, you can sync it with your Blu-ray copy of the film, via WiFi, to provide a second screen that allows you to use your iPad as a remote control and directly access the scenes that you are referencing on your iPad! Let me begin by saying that I don’t have a Blu-ray copy of the film (yet), so my review is based on THBoD solely as a stand alone app. Navigation is not only intuitive, but an adventure. Every time that I have opened a page, I always find that there is some material that I’ve yet to access. And there is a wealth of material! After watching some of the outtakes, I absolutely have to purchase the Blu-ray. As I recall the film when I first saw it in the theater, it looked liked it had been processed by a company that produces student films. But when I saw the outtakes on my 3G iPad … WHOA! 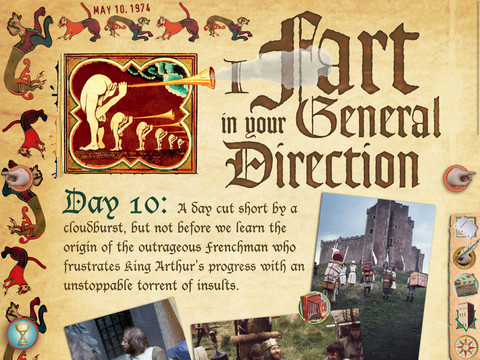 There’s also an engaging story bout the taunter at the top of the castle (“I fart in your general direction!”) . It seems that several weeks before production, Cleese was reading a book on the period. He came to learn that castles had men whose job was solely to taunt the approaching army. Of course, Cleese’s mind took it from there and the idea became one of the classic scenes of the film. As I said earlier, I don’t currently own a Blu-ray copy of the film. 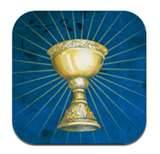 So, I judged this as a standalone app. And I’m not engaging in hyperbole when I say that this is absolutely one of the best produced iPad apps that I have ever scene. 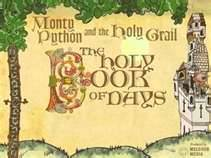 ‘Monty Python and the Holy Grail – The Holy Book of Days’ is a no brainer if you’re a Python fan. I would also recommend this for film school students, as it shows you the realities of what can go wrong and obstacles that you’ll encounter when producing a film out in the real world. And if you don’t fall into either of those camps, buy it anyway. You’ll be entertained for days on end. This entry was posted on Wednesday, June 6th, 2012 at 4:18 pm	and tagged with iOS software, iPad and posted in Reviews. You can follow any responses to this entry through the RSS 2.0 feed.